In what could be considered as the nth clarification about his rumored relationship with Shaina Magdayao, hunk Kapamilya actor Piolo Pascual maintained that they are not a couple nor are they dating yet. With regard to the recent photo that leaked on the web with him appearing to be holding hands with Shaina at the recently-concluded “ASAP 18” show held in Marikina as part of the Grand Kapamilya Weekend celebration, Piolo, during the press conference held at Max's Restaurant-Roces on October 14 for the upcoming SunPIOLOgy Color Run happening on November 23, explained that there’s no malice about that gesture. “We’re not officially together pero natutuwa lang ako kay Shai because she lets me do that kasi affectionate akong tao eh,” said Piolo. He reiterated that it in the event that they are in a relationship, which they’re not, it would prove to be too impossible for them to hide their relationship anyway. But then, he curiously added that he’s not writing off the 24-year-old actress out of his prospects’ list completely. “Kasi if there’s anyone on this business that I wanna be with, siguro si Shaina naman ‘yun eh wala namang iba. Parang sa akin siya ‘yung kasama ko noon and close naman kami so I just don’t see doing that with anyone,” said the Sun Life ambassador. Despite repeatedly lauding the “Juan Dela Cruz” star for being “very mature for her age” and revealing that they are of the “same wavelength” Piolo revealed that fulfilling his promise to his son is the reason why love remains at the backburner. “More than anything it’s my son kasi if it was up to me matagal na siguro pero siyempre nangako ako sa bata na hindi ko na siya bibiguin ulit,” confessed Piolo. “Ayaw niyang may girlfriend ako eh kaya that’s one reason kaya hindi rin ako makapag all the way kasi you know minsan ko lang makita ‘yung anak ko eh parang kung bibigyan ko pa ng ibang trabaho ‘yung sarili ko parang wala na akong oras para sakanya,” he explained about his son, who resides in the US with his mother. Despite hoping not to fail his son anew with his new relationship, Piolo highlighted that at the end of the day his decision as to who he would fall in love with won’t be dictated by Iñigo. “I don’t think it would be up to him na he will have to tell me who I should be with nasa akin naman ‘yun eh. Pero I told him na you should be my Best Man so you should be there for me and whoever I end up with kasi ganon rin naman ako sakanya eh. I’ll be supporting him kung sino man ang maging girlfriend niya but he has to respect my decision too,” said the “On The Job” actor. Does he have any prospect apart from Shaina? “Mahirap magsalita eh. Hindi naman sa naghahanap ako pero if there’s anyone out there it could be Shai pero siyempre we have other priorities rin. Hindi ko rin mapangunahan eh kaya hindi rin ako makapagsalita because ayoko naman sabihin na there’s nothing kasi siya lang naman ang nakakasama ko eh. 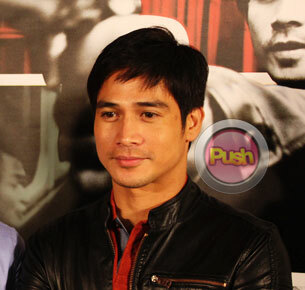 She’s very aware naman that I need time to devote para sa anak ko,” said Piolo. So he does have feelings for her? “Oo naman po, hindi naman po mawawala ‘yun,” he replied. Many were curious as to how their being linked to each other actually started. “Actually kapag nag-uusap kami ni Shai parang lahat ng buhay naming magkasama kami eh. Sa Star Magic Ball, sa mga events sa ‘ASAP’ magkasama kami palagi and we’re really good friends. So kung saan man po umabot ‘yon, I guess Shaina and I have matured enough in this business and at the same time masaya kami sa friendship namin. " “We’re not exclusively-dating. Matagal na kamin magkaibigan ni Shai pero siyempre ang priority ko eh ‘yung anak ko. I don’t wanna limit her too but if there’s someone closest to my heart si Shaina ‘yon,” he clarified. With the way he dodges all the rumors about Shaina, at 36, Piolo appears to be not too ready to get serious yet or much less settle down. Does he see himself tying the knot? “Siyempre naman po. So in two years time sabi ko sa anak ko doon ako magseseryoso para I wanna be give him more time naman kasi hindi ko kasama ‘yung bata eh nakakasama ko lang kapag summer,” related Piolo.